PLoS Comput Biol. 2013;9(5):e1003052. doi: 10.1371/journal.pcbi.1003052. Epub 2013 May 2. Bird songs range in form from the simple notes of a Chipping Sparrow to the rich performance of the nightingale. Non-adjacent correlations can be found in the syntax of some birdsongs, indicating that the choice of what to sing next is determined not only by the current syllable, but also by previous syllables sung. Here we examine the song of the domesticated canary, a complex singer whose song consists of syllables, grouped into phrases that are arranged in flexible sequences. Phrases are defined by a fundamental time-scale that is independent of the underlying syllable duration. We show that the ordering of phrases is governed by long-range rules: the choice of what phrase to sing next in a given context depends on the history of the song, and for some syllables, highly specific rules produce correlations in song over timescales of up to ten seconds. The neural basis of these long-range correlations may provide insight into how complex behaviors are assembled from more elementary, stereotyped modules. Bird songs range in form from the simple notes of a Chipping Sparrow to the complex repertoire of the nightingale. Recent studies suggest that bird songs may contain non-adjacent dependencies where the choice of what to sing next depends on the history of what has already been produced. However, the complexity of these rules has not been examined statistically for the most elaborate avian singers. Here we show that one complex singer—the domesticated canary—produces a song that is strongly influenced by long-range rules. The choice of how long to repeat a given note or which note to choose next depends on the history of the song, and these dependencies span intervals of time much longer than previously assumed for birdsong. Like most forms of human music, the songs of canaries contain patterns expressed over long timescales, governed by rules that apply to multiple levels of a temporal hierarchy. This vocal complexity provides a valuable model to examine how ordered behaviors are assembled from more elementary neural components in a relatively simple neural circuit. FIGURE 1: Sonograms show a relationship between phrase duration, the context of a phrase, and future choices. Phrases consist of repetitions of elementary units—the syllables. 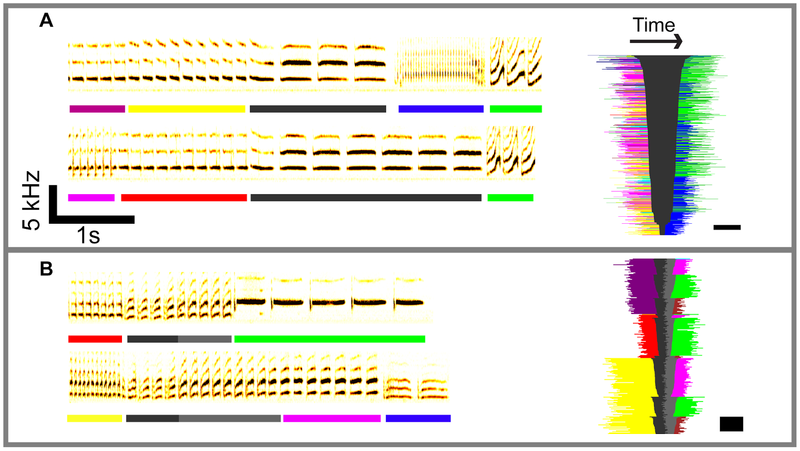 Distinct phrase types are indicated by colored bars beneath each sonogram. On the right side of each sonogram is a “barcode” summary of all occurrences of the phrases shown in the sonograms. The phrases before (left) and after (right) the gray phrase are color-coded by syllable identity, and the length of the bars in each row indicates duration of the phrase. A square flanks each barcode to indicate the scale, with the width corresponding to 2 seconds and the height to 20 trials. A, A case where the duration of a phrase predicts the future path—the barcode is sorted by duration of the black phrase. Short black bars on the bottom of the barcode typically lead to blue, while long black bars at the top typically lead to green. B, A case where the identity of the starting phrase (red, yellow, or purple) determines which phrase type comes after the black/gray phrase (green or magenta for example.) The barcode in this panel is sorted by the phrase that comes before the black/gray phrase.